Organic. 100% natural & organic. Baking & cooking. High in fibre & protein. Gluten and grain free. Suitable for vegetarians and vegans. 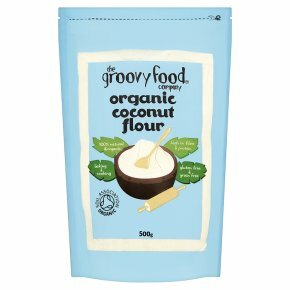 Kosher - KLBD.Our organic coconut flour comes from the dried flesh of the mighty coconut which is finely ground to create a versatile home baking ingredient rich in fibre and protein - wow! Its mild natural sweetness means it loves to be whipped up and whizzed in to breads, cakes, muffins, pancakes, desserts, smoothies and shakes. It's also a great thickener for sauces and curries. Coconut flour is different from grain flours. Its high fibre content makes it more absorbent, so you use less and it goes further. Please visit our website for helpful hints and tips about how to use our coconut flour, as well as lots of lovely recipes. Give it a try, we hope you enjoy the tasty results.